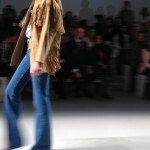 My little Friday moan about London Fashion Week! 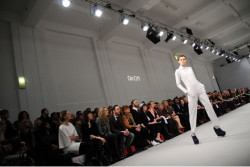 I was extremely excited to be attending my first ever fashion show at London Fashion Week this year. Going to this event has always been on my to do list in life, so my expectations were pretty high as I imagined my time would be spent mingling with the stars and celebrities of the fashion world. As I approached Somerset House I knew I would soon be sitting alongside a catwalk watching an array of gorgeous clothes and accessories being paraded up and down making a mental list of everything I would buy – if I ever won the lottery. But instead of people being whisked into the show, we were told to wait. An ever-growing crowd of fashionistas formed and everyone was becoming very impatient. Some people even used the words `Don`t you know who I am?` I couldn`t believe it. In my mind I had erased all the lovely thoughts of the fabulous and glamorous atmosphere of LFW. Even the elite of fashion were being denied access, so what was the chance of little ol` me being let into the show? Zero. Roughly 45 minutes later the group of us that had been waiting were told that the show was full and we had to leave. Definitely disappointing. In my eyes, it seems that if you are not a celebrity of some kind or you don`t know anyone `on the inside` it will be pretty tough to get into any show. But is it like this all the time? Or, was it just a one off? All I know is my view of London Fashion Week changed dramatically after that day. It isn`t all glitz and glam and fabulous clothes. Oh well – better luck next time I say! Clothes Show Live is coming to London!